On my third day in the Scott Mountains in the northeast corner of the Trinity Alps, I had some unfinished business at Scott Mtn Summit where Hwy3 goes over the range. Scott Mountain, a CC-listed summit, is found about a mile and a half east of the highway. I had done a large outing the previous day on the west of the highway, but ran out of time and energy for Scott Mtn. So I spent the night off a dirt/gravel spur road and moved the van a quarter mile to the PCT trailhead alongside the highway in the morning. I had learned that it does not get light early here at this time of year, so I slept in until 6:30a and did not get going on the hike until after 7a. It was 38F when I started in the morning, but it would warm up nicely and be quite comfortable for hiking within a short time. Hiking east on the PCT, I followed the trail for only about 2/3mi before leaving it to head uphill more directly to Scott Mtn. I was in the shade the whole time I was climbing the west slopes of the peak, but to the west the sun was shining brightly on Black Rock and Craggy Peak where I'd climbed yesterday. There was some modest brush mixed with forest on my way up, but nothing to give any real trouble. Enroute I crossed a number of old logging roads and one road still in use, though not shown on the topo map. A better vehicle and more research might allow one to drive high on this mountain. In 45min I had reached the lower west end of the summit ridge where a small communications tower is located, and less than 10min beyond this the summit is reached. I topped out at 8a and was treated to fine views in all directions. There is a benchmark and a register dating to 2007 with 12 pages of entries. The last party to visit had been the previous year and turned out to be Courtney Purcell (whom I last climbed with in Red Rocks, NV) and his girlfriend, having come a very long way from their home in Las Vegas. Rather than return the way I'd come, I decided to make a mini-adventure of it and drop directly down the south side to the PCT I knew was traversing around that side of the mountain. There was more brush here than on the west side, not enough to be a pain, but enough to make it interesting. After descending almost 700ft I came upon the PCT almost before I could see it snaking across the hillside. From the trail it was about 2.5mi back to my starting point. I cut off about half a mile of this with another cross-country manuever when I was on the west side again. By 9a I had finished up and was soon driving onto the the day's bigger adventure. 21mi of driving got me down to the base of the Scott Mtns on the NW side and back up to Kangaroo Lake and CG located at about 6,500ft, all on paved roads. This is the shortest approach to Cory Peak, another CC-listed summit. It would have been less than 4mi one-way to reach just Cory, a little too easy of an outing, but there are three unnamed bonus peaks in the area, each with more than 300ft of prominence. One of these, with Cory, lies atop the crest of the range. The other two are found off the south side of the crest, all less than half a mile from the PCT, making for easy access and a fun outing. I started up the Fen Trail, the TH located a short distance west from the end of the road at Kangaroo Lake. From the many placards posted along the first half mile of trail, I learned that the reddish rock that comprises much of the Scott Mtns is called ultramalfic, an igneous rock that forms deep in the earth under high pressure. Some of the rock here has been dated back more than 350 million years, making it some of the oldest rock found in North America. In this area the rock forms a cap only a few feet below the surface, allowing water to stay close to the surface in many places. These form fens, which are different from bogs in that the water is not stagnant. Insect devouring pitcher plants are one of the unusual flora species that grow uniquely in the fens found here. The trail climbs the north side of the range in several long switchbacks, offering a nice view overlooking Kangaroo Lake at one point before going over the crest and dropping to the PCT. Where it tops out, I turned right to head southwest to Peak 6,854ft only 1/3mi distance. Typical of all three of these bonus peaks, the route was open for the most part, over rocky terrain with only mild brush. This was the only one of the three bonus peaks sporting a register, and older than any I'd see today, dating to 1998. There were more than 20 pages, most of them showing burn marks from a fire that must have swept over the summit sometime in the past. Rather than return to the Fen Trail where I'd left it, I began descending to the east in order to intercept the PCT below the crest. The cross-country here was quite easy over open, grassy slopes. Once on the PCT, I followed it for just over a mile to where it goes over a saddle between the crest and Peak 7,087ft to the south. A trail junction for the Sisson-Callahan Trail is found here, an alternate to the PCT that drops down to Robbers Meadow before returning to the PCT further east. Once again I left the trail to follow a fairly easy route up to the second bonus peak, taking all of 15min. I took a few photos looking west, east and south before returning to the PCT. Another 1.5mi along the trail took me around the base of Cory Peak on the south side, to a second saddle with the third bonus, Peak 7,354ft. This is also where the alternate trail returns to the PCT. Looking down the east side of the saddle gives one a view of Bull Lake (another trail drops from this junction down to the lake and then follows Bull Creek down to Forest Rd 17). Turning south, another 15min saw me to the summit of Peak 7,354ft over mostly rocky terrain. After returning again to the PCT, I followed it around the saddle to the north for a short distance before starting up to Cory Peak. One can climb up from the saddle as well, but my route avoided some extra rockiness that one gets by starting there. Cory Peak lies only 0.7mi from where I left the trail, rising up almost 700ft. There are a few false summits one must go over when climbing the SE Ridge as the highpoint is found at the far NW end of the summit ridge. 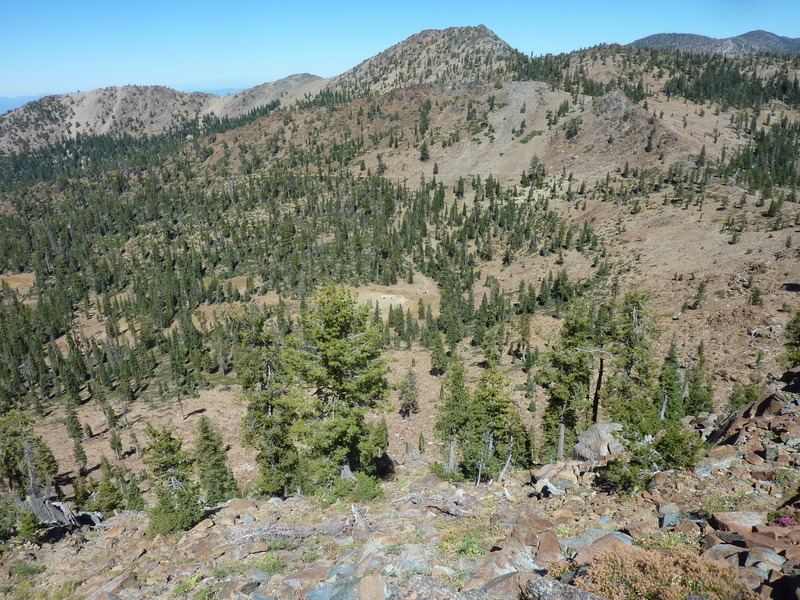 It was 1:20p when I reached the top, finding a benchmark, a register and the remains of an old wooden survey tower and another unidentified structure. The register was just a piece of notebook paper dating back only a few years. My original plan was to descend off the west side of Cory and follow the crest for about 1.7mi back to the Fen Trail, but now that I was looking at it, it seemed really long and a bit tedious. I probably wouldn't have used "tedious" in the beginning of the day, but the day was getting on and I was getting a little tired. So after dropping the first hundred feet or so down that side, I angled southwest and dropped about 500ft down to the PCT. As I made my way back over the first saddle and followed the trail for about a mile and half, I paused where the PCT reaches very near to the crest above the east end of Kangaroo Lake. I couldn't see the lake, but wondered if I couldn't drop down the north side of the crest and take a shortcut back. Seemed worth a try, and over I went. After dropping steeply for a few hundred feet, the angle eased and I followed down through forest, not actually seeing the lake until I was only a few minutes from it. A trail goes around the north side of the lake and made for a convenient return back to the campground on the west side of the lake and the van another quarter mile down the road. It was 2:40p by the time I finished up - not the hardest day of this trip, to be sure.